France. 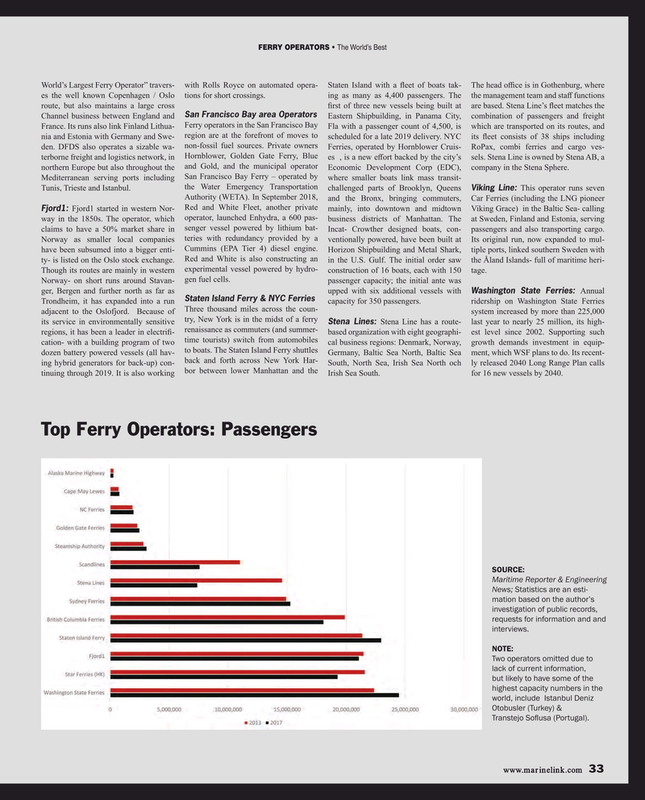 Its runs also link Finland Lithua- Ferry operators in the San Francisco Bay Fla with a passenger count of 4,500, is which are transported on its routes, and nia and Estonia with Germany and Swe- region are at the forefront of moves to scheduled for a late 2019 delivery. NYC its feet consists of 38 ships including den. DFDS also operates a sizable wa- non-fossil fuel sources. Private owners Ferries, operated by Hornblower Cruis- RoPax, combi ferries and cargo ves- terborne freight and logistics network, in Hornblower, Golden Gate Ferry, Blue es , is a new efort backed by the city’s sels. Stena Line is owned by Stena AB, a northern Europe but also throughout the and Gold, and the municipal operator Economic Development Corp (EDC), company in the Stena Sphere. Incat- Crowther designed boats, con- passengers and also transporting cargo. Though its routes are mainly in western experimental vessel powered by hydro- construction of 16 boats, each with 150 tage. gen fuel cells. Trondheim, it has expanded into a run Staten Island Ferry & NYC Ferries capacity for 350 passengers. ridership on Washington State Ferries adjacent to the Oslofjord. Because of Three thousand miles across the coun- system increased by more than 225,000 its service in environmentally sensitive try, New York is in the midst of a ferry Stena Lines: Stena Line has a route- last year to nearly 25 million, its high- renaissance as commuters (and summer- regions, it has been a leader in electrif- based organization with eight geographi- est level since 2002. Supporting such cation- with a building program of two time tourists) switch from automobiles cal business regions: Denmark, Norway, growth demands investment in equip- to boats. The Staten Island Ferry shuttles dozen battery powered vessels (all hav- Germany, Baltic Sea North, Baltic Sea ment, which WSF plans to do. Its recent- back and forth across New York Har- ing hybrid generators for back-up) con- South, North Sea, Irish Sea North och ly released 2040 Long Range Plan calls tinuing through 2019. It is also working bor between lower Manhattan and the Irish Sea South. for 16 new vessels by 2040.